In March of 1917 the Georgian Apostolic Orthodox Church declared its autocephaly restored. 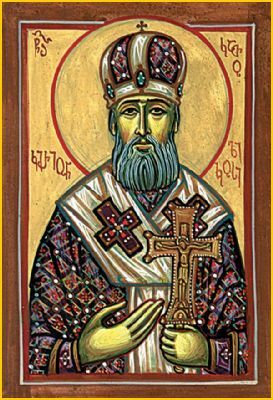 At the incessant demands of the Georgian people, St. Kirion finally returned to his motherland. One hundred and twenty cavalrymen met him in Aragvi Gorge (along the Georgian Military Highway) and reverently escorted him to the capital. In Tbilisi St. Kirion was met with great honor. In September of 1917 the Holy Synod of the Georgian Orthodox Church enthroned Bishop Kirion as Catholicos-Patriarch of All Georgia. During the enthronement ceremony at Svetitskhoveli Cathedral, St. Kirion addressed the faithful: “My beloved motherland, the nation protected by the Most Holy Theotokos, purified in the furnace by tribulations and suffering, washed in its own tears: I turn to you, having been separated from you, having sought after you, having grieved over you, having sought for you and now having returned not as a prodigal son, but as your confidant and the conscience of your Church. Rumors were even spread that St. Kirion had shot himself. When the Holy Synod of the Georgian Apostolic Orthodox Church convened on October 17, 2002, it canonized Holy Hieromartyr Kirion and numbered him among the saints.